Green Valley Ranch - New water heater, garage door & opener. 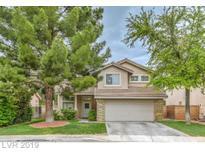 MLS#2081105. Prestige Properties. Very rare 1 story on a fifth of an acre in the heart of Green Valley Ranch*Gated community*Backs to walking path and park*Great open floor plan*Over sized back yard w/sparkling pool, great for those Summer BBQ's*Green Valley Ranch is one of the most desirable, sought after subdivisions in the Greater Las Vegas/Henderson areas*The Ranch is filled with beautiful parks & miles of walking & bike paths MLS#2077756. Realty ONE Group, Inc. Relaxing yard w gazebo, pool, views. Won’t last! MLS#2079692. Realty ONE Group, Inc.
Green Valley Ranch - Master suite on 2nd level has exciting views of Las Vegas Strip! Bonus room on 3rd floor! MLS#2080055. RE/MAX Advantage. Green Valley Ranch - House backs to walking trail so no neighbor's behind. :) MLS#2080064. Simply Vegas. Highlands At Mac Donald Ranch - Cul-de-sac Centerpiece In Dragonridge Country Club* Custom 1 Story Home W/ A Mixture Of Modern & Traditional Finishes* Control 4 Automation* Luxury Floorplan Covered In Natural Light* Island Kitchen W/ Viking Appliances & Ample Storage * Master Ste Complete W/ Huge Custom Closet & Gym* Large Bedrooms W/ Jack & Jill Baths Separated By 2 Office/Dens Sure To Accommodate Any Lifestyle* Backyard Getaway W/ Built In Kitchen, Outdoor Shower & Pool/Spa* MLS#2078492. Key Realty Southwest LLC. Green Valley Ranch - Saltwater waterfall pool and spa with security fencing, dog run with irrigation system for cleaning MLS#2079153. Addicted Realty LLC. Full bed and bath down, master and ensuite up! MLS#2078630. Better Life Realty. Hurry prices are going up FAST in this area!!! ! MLS#2078496. Galindo Group Real Estate. Green Valley Ranch - Walk to the District at Green Valley, Henderson Mutli-Generational Center, Library and Parks. 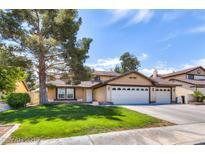 MLS#2078637. Property Management of LV, LLC. Formal living room and Formal dining room. MLS#2078424. Synergy Sothebys Int'l Realty. Clearwater Canyon - Updated kitchen & Bathroom cabinets, and granite counter tops. RV parking. MLS#2077659. Brady Realty Group, LLC. Green Valley Ranch - Gorgeous home*upgrd glass entry door*glass door to den*formal dining*HUGE great rm w/custom built-in ent ctr*large open kitchen w/upgraded granite & cabinets*surround sound in GR, also wired out back*Upgraded tile/Upgraded waterproof laminate*neutral paint*upgrd iron stair rails*large loft*bed & ba down*lrg mstr suite w/spa-like mstr ba*good sized 2nd rms*beautiful yard w/sparkling pool/spa*across from park in gated *RV prk allowed*original ownr MLS#2077698. RE/MAX Advantage. Green Valley Ranch - Adjacent to Seven Hills, great schools, home is 2 story at culdesac, formal living and dining, spacious family room, gourmet kitchen CT, granite CT, SS appliances, upgraded cabs, master bath updated, tiles and laminate wood flrg downstairs, alarm system, desert landscaping, covered patio, interior newly painted..sold AS IS; $5K INCENTIVE TOWARD BUYERS CC MLS#2074884. Go Global Realty. 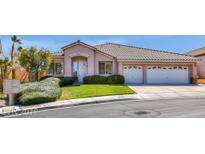 Green Valley Ranch - All in walking distance to District MLS#2075979. Black & Cherry Real Estate. Green Valley Ranch - Fresh interior paint, remodeled shower in master, in-ground fertilizer system, updated irrigation system, 3 gas fireplaces, plantation shutters, water softener & more! MLS#2076050. Keller Williams Southern Nevada. ** Beautiful Single Story In Highly Desirable Neighborhood In Green Valley Ranch ** Three Car Garage ** This House Has Been Well Loved And Well Maintained ** Easy Access To Schools, Shopping, Restaurants, Parks, Library, The District And Freeways ** Located On Quarter Acre In A Very Quiet Area ** Park-like Back Yard With Beautiful Desert Landscaping ** Covered Patio & Built In Bar-b-que ** MLS#2075019. Realty ONE Group, Inc.
Clearwater Canyon - Immaculately maintained by the original owner..Close to GVR Casino & the District.. 3100 sq ft with 4 bedrooms + giant game room or media room...1st floor bedroom & bath..Living & dining rooms.1st floor is tile & laminate other than the bedroom...Spacious master suite & large master bathroom.2 additional upstairs bedrooms.Pool sized backyard with covered patio, synthetic grass and low maintenance landscape . Exterior of home just painted.. MLS#2075329. BHHS Nevada Properties. 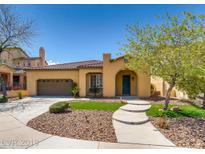 Green Valley Ranch - Lush green private yard w/ pool/spa & built-in BBQ. Move-in ready! ! MLS#2073908. ERA Brokers Consolidated. Inviting salt water pool/spa w/water features, Built-in BBQ on over a quarter of an acre. MLS#2073470. Simply Vegas. Clearwater Canyon - "April Air" electronic filter system in the HVAC system. MLS#2072490. Platinum R.E. Professionals. Bedroom #5 has en-suite bathroom & Walk-in Closet. MLS#2071789. Cornel Realty LLC. Master bath has marble shower surround and counters. And, much, much more... MLS#2072383. Signature Real Estate Group. Ready for some TLC upgrades and your personal touch. MLS#2072024. LVRE.com.